Fully automatic correction of summer/winter time. Easy to program. Programming by simple YES/NO instructions over the easy to read LCD display. To achieve absolute accuracy, radio synchronization with WWVB is available as an option. 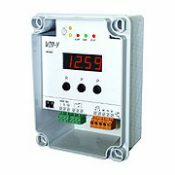 LED-indication of power on, activated relay output and receipt of time code signal. Built-in “Time Keeper Memory” with lithium battery stores programmed data for 10 years.